2. 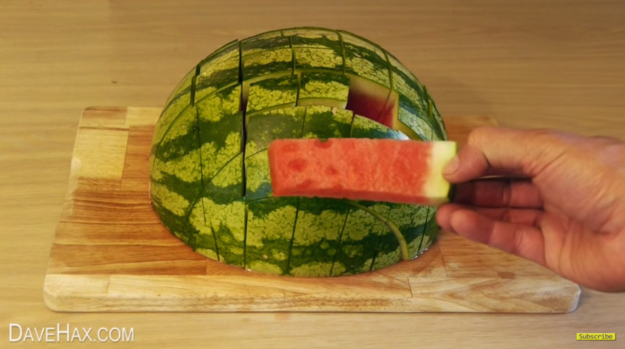 If you're looking for the most effective way to chop your watermelon, look no further. 3. I don't know why it took us so long to figure out how to chop chop around the seeds and pith of a pepper, but we got there. 4. Don't throw out that plastic bottle yet! It's all you need to separate your yolks from your egg whites quickly and easily. 5. Of course, you could always just use wet hands instead. Those also work pretty well. 6. Wet hands also work really well for getting pesky shell bits out of cracked eggs. 7. Actually, you don't even need to worry about the shells when you use this method for peeling your hard-boiled eggs. 8. Who has the time to individually slice cherry tomatoes? Just use a couple plates to slice a whole bunch of those bad boys all at once. 9. Speaking of slicing, you probably already have a rarely used tool in your arsenal that's perfect for chopping those tricky fresh herbs: your pizza cutter. 10. Cutting a shallow slice around a potato before boiling will make it real easy to peel afterwards. 11. Surely everyone knows this trick for easily pitting an avocado, right? No? Well, here you go. 12. And while you're at it, you can slice that avocado pretty easily when it's still in its shell. 13. You can use the edge of a glass to easily scoop out the insides of a mango. Yum! Mango! 14. Results may vary on this one, but a wooden spoon can help keep a pot from boiling over. 15. A damp paper towel will keep your cutting board from slipping around too much. No more sliced up fingers for you! 16. And now that your cutting board is secure, here's the best way to dice an onion. Clean, even pieces, every single time.